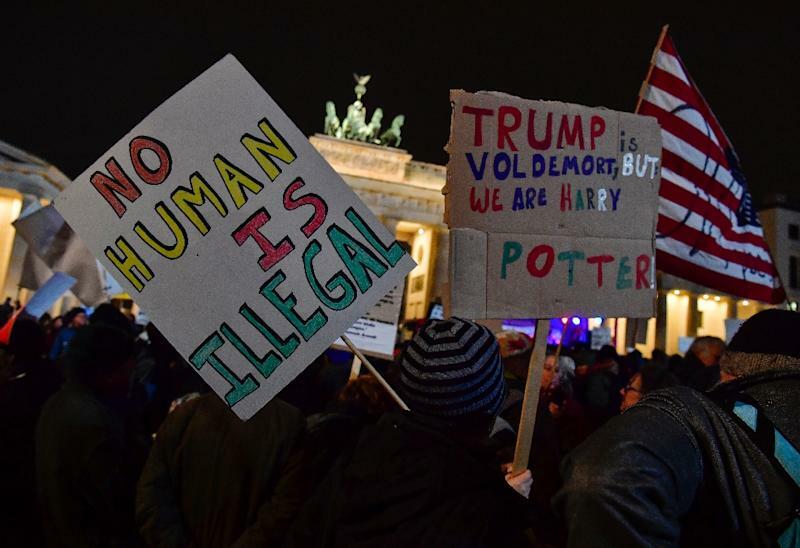 Paris (AFP) - Terrifying, hideous, racist, atrocious and a "disgrace to humanity": Protesters around Europe pulled no punches in reacting to Donald Trump's inauguration as US president on Friday. 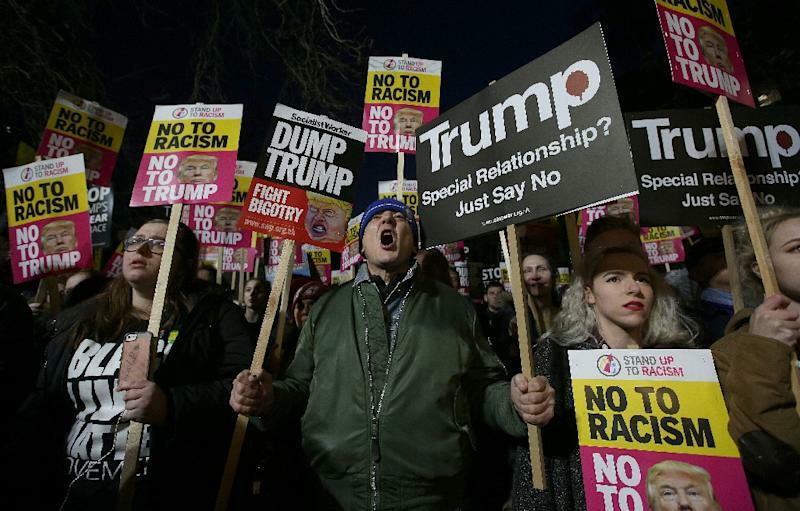 Around 500 activists gathered at the US embassy in London where placards urged Americans to "Dump Trump", whom they accused of being a "climate disaster". Artist James Marriott, a supporter of opposition Labour party leader Jeremy Corbyn, held a poster calling Trump "a disgrace to humanity". "Trump is part of a substantial shift moving into something much more turbulent and frightening," Marriott told AFP. "He represents the possibility that it is acceptable to be racist, sexist and homophobic." Janie Trowell, a 53-year-old teacher, compared Trump to the wider populist movement sweeping across Europe in the form of Britain's Brexit vote and the rise of the far-right presidential hopeful Marine Le Pen in France. "He is advocating hate, he is a scary and hideous macho white male. In Germany, 200-300 protesters combined their opposition to Trump with their disdain for the country's right-wing AfD party, warning that such populists reminded them of the Nazis. "White nationalism is so 1933", read one banner, while another said: "No to global Trumpism, no to the AfD". In glacial conditions, the protesters marched from the AfD headquarters in Berlin to the Brandenburg Gate, a symbol of European unity. They chanted a song about keeping Trump locked up in his namesake tower, adding: "this is called people power". A "Stop the Hate" demonstration through the streets of Amsterdam drew around a thousand people who marched on the US Consulate. They carried placards bearing messages including "you can't unify with hate" and also took aim at the far right in the Netherlands. In Brussels, several hundred people gathered outside a theatre in the city centre, mainly from leftwing and environmental groups, leftwing parties, feminist groups, Amnesty International and expatriate supporters of the Democratic Party. Outside the US Consulate General in Edinburgh around 300 protesters were amongst the most imaginative and colourful around Europe. One banner mocked Trump's hairstyle, saying: "Donald Dinnae Comb-Over Here", while some people performed an "excommunication ceremony". One elaborately dressed and bearded marcher with white facepaint, who gave his name as Sister Ann Ticipation, said: "We were excommunicating him from the great divine for promulgating negativity, racism, sexism, homophobia, transphobia and everything he has done which does not serve the interests of the community." University lecturer Don Glickstein, 62, said Trump's "attitude to women is absolutely shocking, and he’s proud of it. "He's also expressed a readiness to use nuclear weapons, which really frightens me." Only around 30 people -- Americans and Portuguese -- turned up to a protest in Lisbon but they made clear that Trump's appointment was a step in the wrong direction. 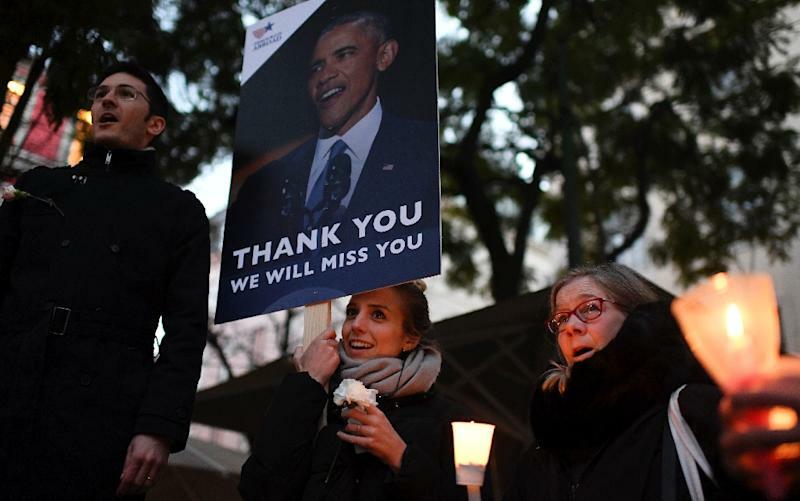 "Obama thank you, we will miss you," read one banner. However, Europe was not united in its condemnation of Trump. In Prague, photographers turned up to cover a protest that never took place for lack of activists. Meanwhile, in Warsaw, the foreign affairs ministers of Poland and Lithuania demonstrated that Russian aggression was paramount in their concerns, expressing the hope that Trump would back up commitments the Barrack Obama administration made to supporting defence in Eastern Europe. Poland's Witold Waszczykowski welcomed the Trump administration "with the hope to see it deal with security questions in our region". Linas Linkevicius of Lithuania added that it was important to "engage in cooperation with US partners as soon as possible... to preserve what was created together for the sake of both sides of the ocean".